Beautiful natural white, 25% cotton writing paper in durable hardbound journal is perfect for a broad range of ink varieties and writing instruments. Hardbound Journals feature Smyth-sewn binding and non-photo blue lined pages. 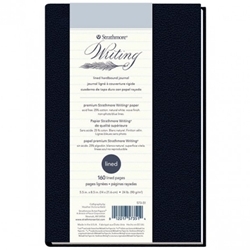 Hardbound Writing Journals feature a lightly-textured, matte hard cover in navy blue. 160 sheets, acid free. Measures 5.5" x 8.5".